Trash Polka is a tattoo style that was invented by two Germans named Volker Merschky and Simone Pfaff, in 1998. Trash Polka tattoos have become popular lately as more and more people around the world are showing interest in inking their bodies with a design as unique as Trash Polka. The design is a mix of fine art and some trashy lines, smears, smudges, and strokes. The Trash Polka art is like drawing a beautiful piece of art on the body and then spoiling it with unappealing designs. Check these 12 Trash Polka tattoo designs that give you a visual idea about this unique tattoo trend. This photo clearly explains what exactly a Trash Polka tattoo is. Apparently, you can see the pictorial references to a bird, a couple of helicopters, and some flowers. 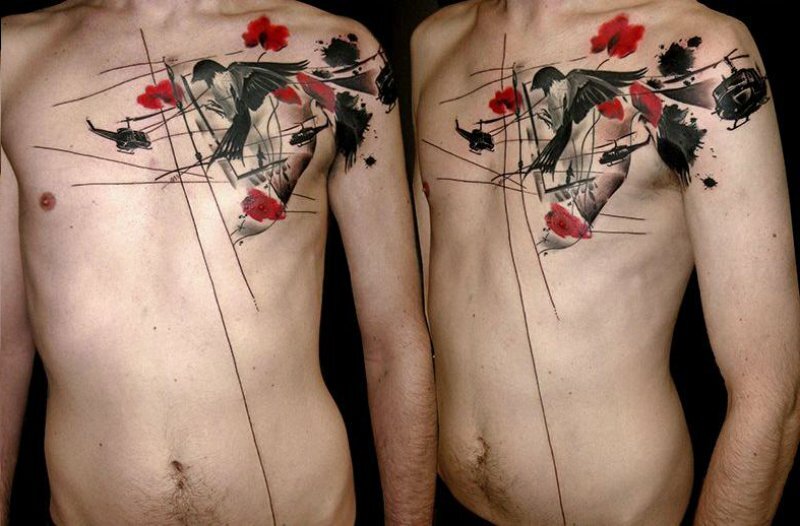 Evidently, the beautiful art within the tattoo has been trashed by those unsightly straight lines stroked across the body. If you find those lines ugly, then Trash Polka tattoos aren't for you! As said earlier, a Trash Polka tattoo is nothing but a stained piece of art on the body. Trash Polka art looks appealing for many people, and that is the reason why these tattoos have gained some popularity in the recent years. 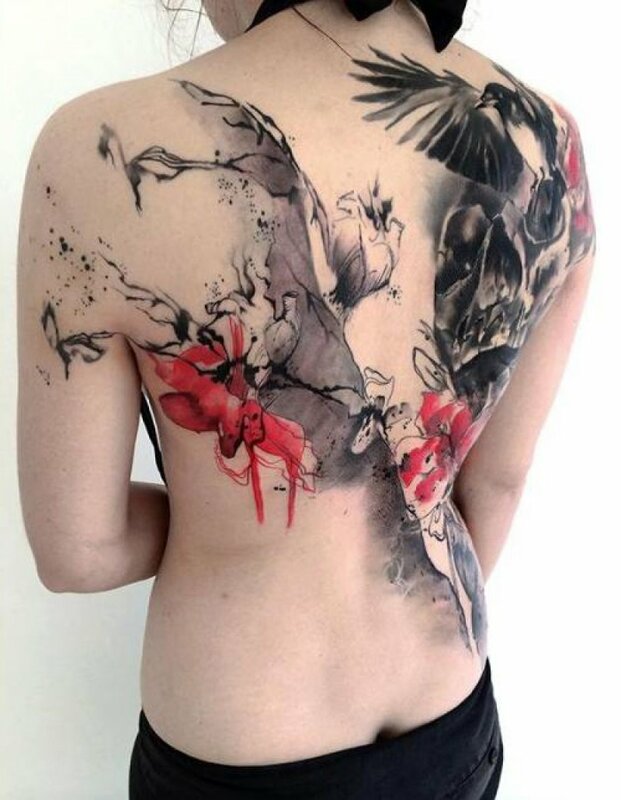 Apart from a bird and flowers, nothing is clearly visible in this tattoo. If you are wondering about the possible meaning of the tattoo, let us tell you that Trash Polka body art doesn't convey a particular message. It's very hard and nearly impossible to interpret an implication out of many Trash Polka designs. Every Trash Polka tattoo has a universal meaning, which is depicting two sides of everything such as happiness and sadness, fortune and misery, wealth and poverty, etc. 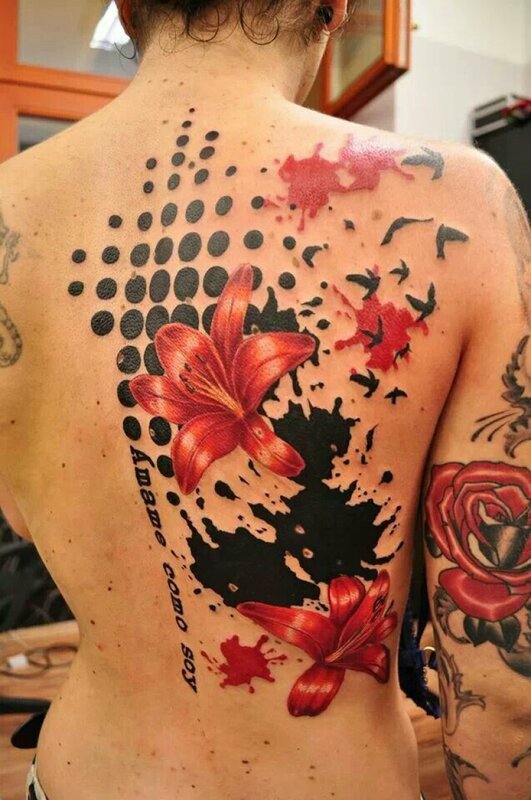 This Trash Polka tat on the back looks good, and just scroll down to see more such fascinating and inspiring tattoo designs. This tattoo looks impressive, as the wearer apparently had chosen geometric shapes over amorphous strokes or smears. As you can see, the three striking things in this tattoo are birds, flowers, and that Spanish quote, "Amame Como Soy." The sentence roughly translates to "Love me as I'm" in English. And yes, we have to tilt our head a little bit toward the right to read that quote. 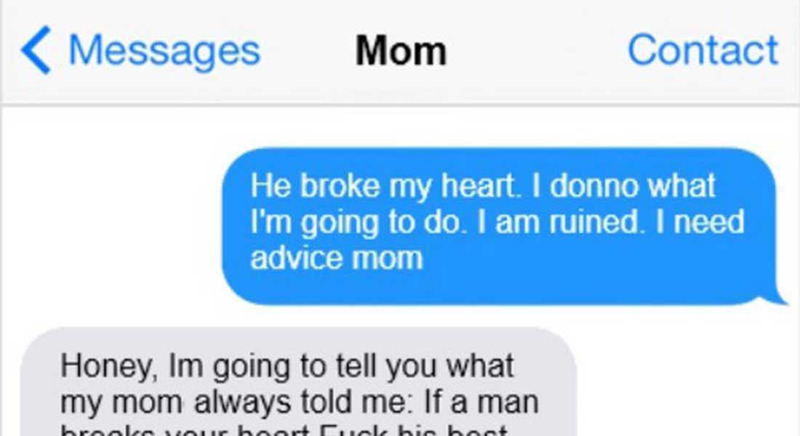 The rule of thumb is that you should tattoo a quote vertically so that it becomes easy for people to understand. Since Trash Polka designs don't follow standard body art rules, it is safe to assume that this tattoo looks perfect in every sense.